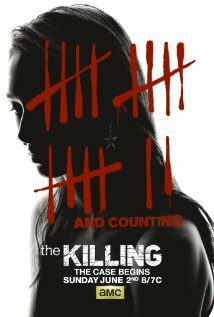 In its first season, AMC’s The Killing took me a little while to warm up to, and I only watched a few episodes before deciding it wasn’t for me. I then rediscovered the series on Netflix and was hooked. The Killing, based on a Swedish crime show called Forbrydelsen, is set in Seattle, Washington, and follows a similar plot. Detective Sarah Linden (Mireille Enos) is called to begin one last case on the eve of her last day at work. She is planning to give up detective work and move to California with her son and to begin a new, married life with the man she loves. The discovery of a teenaged girl’s body in the trunk of a car presents an intriguing and heartbreaking mystery for Linden, and the detective finds herself continually delaying her departure for her wedding. Linden is joined in her investigation by a newly promoted narcotics officer, Stephen Holder (Joel Kinnaman), whose methods are slightly unorthodox. Why The Killing would make a good book series: Its pacing and somber tone. The Killing is not for those who want quick action and resolutions. Much like a good novel or book, this series is slow-moving and character development is more important than merely moving the plot ahead. The doom the audience and detectives feel in the first episode slowly grows over time as the threads of mystery begin to unravel. It is a credit to the series that time and time again, things are discovered to be far different from first impressions. The tone of the film is almost entirely due to its setting. Seattle is portrayed as a continually cloudy, gray city. The colors in each shot are subdued and the music haunting. The death of a girl is treated seriously, as are the efforts of the detectives, despite their obvious flaws. Detective Linden’s obsession to the case is easy to relate to, as is Holder’s eagerness to prove himself in his new position. The acting is much due to the fine characterization and writing of the series, though, I have to give Joel Kinnaman a special shout out for his awesome American accent. For me, the series really came into its own in season three, where we find how truly flawed Detective Linden is, and how capable Detective Holder. The series balances highlighting the detectives faults against their perseverance and natural talent at mystery solving. So many scenes from season three shouted “literature” to me, due again to the mood of the show as well as the excellent characterization. Also, the detectives are never quite happy. This too, goes along with literary tradition. Few, if any book detectives, have anything resembling joy outside of their work. Their work is their happiness, everything else is secondary. Something that makes The Killing stand out for me as well is that the victims are important. Too many murder mysteries focus solely on the smarts of the murderer instead of sorrowing over the plight of the victim. The important people in the series are the detectives, the victims, and the people who knew the victims. The murderers themselves are rightfully forgotten by the time the next mystery begins.